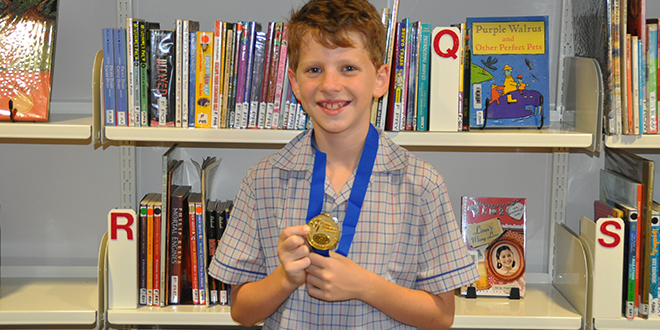 Little champion: Conor Dugan with his Under-10 State gold medal from the IGA State Championships in Cairns. TORRENTIAL rain didn’t scare off Our Lady of Dolours, Mitchelton, student Conor Dugan who fought pelting rain to win the under-10 high jump at the IGA State Championships in Cairns last month. A low-pressure system was sitting just outside of Cairns, and torrential rain fell throughout the weekend of the championships. Conor cleared 1.25m before faltering, and did so in dreadful Northern Queensland rainfall. He beat 24 boys in the same event. It was the worst possible weather conditions for the competition, which was held in Cairns for the first time. But even with the rainfall, Year 5 student Conor left the championships with nothing less than a gold medal and wholehearted support from his school. Conor is a regular competitor in the under-10 age group at both school-based sport events and Little Athletics. Within his Little Athletics club this season, Conor has achieved age champion and qualified as the best high-jumper and thrower in his age group. In February he won the high-jump event at the Metropolitan North Regional Carnival, and finished second at QEII in the junior carnival in early March, qualifying for the state championships. Athletes came from more than 85 clubs throughout Queensland to compete in the IGA State Championships.